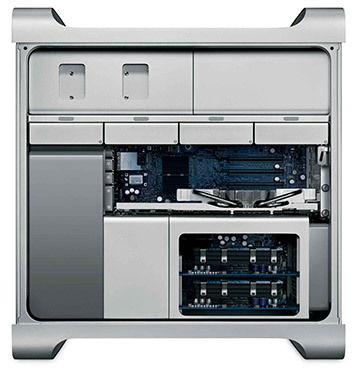 The model Mac Pro quad core 2.8 Server Mid-2010 (Nehalem) gets it's heartbeat from a single 2.8GHz Quad Core 45-nm Xeon W3530 Nehalem processor with 256k of dedicated level 2 cache per core and 8MB of level 3 cache. 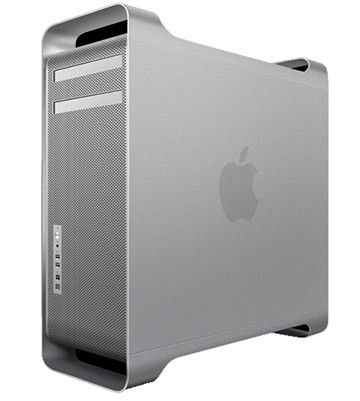 Upgrade options include a single 3.2GHz Quad Core "Nehalem" Xeon (W3565) for plus $400 over base price, a single 3.33GHz Six Core "Westmere" Xeon (W3680) for plus $1200, a Dual 2.4GHz Quad Core "Westmere" Xeon (E5620) for plus $775, Dual 2.66GHz Six Core "Westmere" Xeon (X5650) for plus $2275 and lastly a Dual 2.93GHz Six Core "Westmere" Xeon (X5670) at plus $3475.The base factory configuration for this model is 8GB DDR3-1066 (PC3-8500) ECC SDRAM, two 7200 RPM/32MB cache 1TB 3Gb/s SATA hard drives, an 18X dual-layer "SuperDrive" plus an ATI Radeon HD 5770 graphics card running 1GB of GDDR5 RAM. Expansion is where these models shine with 4 memory slots, each accepting up to 16GB per slot, yielding 64GB possible maximum. It also has 2 external 5.25" front bays, 4 internal 3.5" drive bays, 4 PCIe slots (2X PCIe 2.0 x16 and 2X PCIe 2.0 x4) with the video card using one slot.